4 BR, 5 acres property, Luxury Home. The perfect place to Relax. 4 Bedrooms, 3 Full Bathrooms, 1 Half Bathroom, Sleep 14. Enjoy your vacations staying in the perfect place. It was built on 2008. Lots of FUN FUN FUN for everyone. 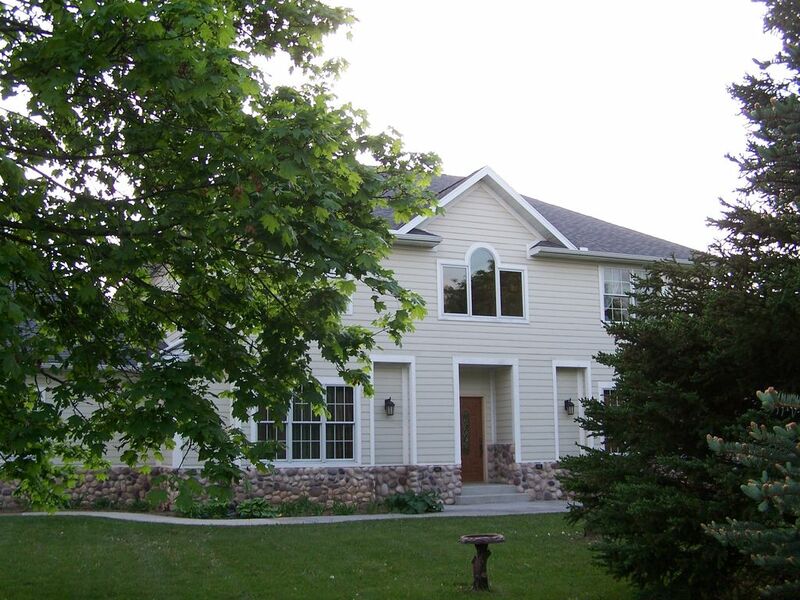 5 acres property; there is a huge private deck with gas grill and plenty of seating to entertain, Fire Pit outside perfect for marshmallows, Office Center with wireless Internet, Two Large Living Rooms with flat screens T.V., Dining Room for entertaining and Fully-Equipped Kitchen, we are located only 7 miles from Lake Geneva, 1 mile access to the Lake in Williams Bay, 45 miles from Milwaukee, One hour and thirty minutes from Chicago, IL. Fireplace. Lake Geneva area offers a wide variety of vacation activities, many excellent restaurants, golf courses, spas, shops. It’s perfect for the kids. Stay for a weekend, Stay for a week, Play the whole Time. Perfect for the KIDS: Beautiful Tree House, Swing Set. Spacious. We have special rates for business travelers, relocation, insurance, government military, construction workers for more info call us. NON-SMOKING PROPERTY. NO PETS ALLOWED. We are located one mile from the public beach. High Chair, Extra chairs available please request if you need it. This was our second time staying at the house, and, for the second time, we had a wonderful time. It's a lovely house with lots of space, both indoor and out. I would highly recommend it. I'd go back here every year. House is wonderful for a group or a large family. Close to everything. We had a mini-family reunion here that included 4 families and was impressed with the size and amenities of the home. Plus it was super close to both Delavan and Williams Bay. Nothing to complain about here. Plenty of space for everyone! Very spacious inside and out! The owner was very responsive before and during our stay! The tree house was a nice treat for the kids and we were thankful to have more than enough firewood for our whole stay. All in all, we were very pleased with our stay and would consider going back if we find ourselves reuniting in WI with family again in the future. Property was ok. Lots of space to spread out. Minimal pots and pans for cooking. Tidy but could use a good dusting. Had an interesting exchange with who I would only assume was the owner. As he came to the back door and asked for a package that was delivered to the property for his son. He never introduced himself or even ask if we needed anything. Even when checking out very little information was conveyed on what to do when you left the house. Overall, it worked for what we needed. We had a nice time and the location was tranquil and close to downtown Lake Geneva. Overall good house. Liked a lot of the rooms and games. Need more utensils and kitchen dinnerware. House is dated, but very clean. Would have liked more towels with so many people in the house. Owner was very accommodating. Enjoyed our stay and had a wonderful weekend. Holidays Rates May Be Higher. Additional charge for extra-persons.